MAKE BBQ'ING EASY, NO MORE CLEANING UP THOSE GREASY GRILLS! Our BBQ replacement drip liners are compatible with almost all Weber grill models. Just fit it in the grease trays of the grill and cook as you normally would. After your outdoor event or barbecue party, simply throw out the foil drip pans. these ready to use, durable cooking trays can be used to cook and store almost any dish! No More Scrubbing Away at Greasy Grills! Using a disposable drip pan is an easy way to keep the grill clean and ready-to-use for the next dinner or event! ✔ Size: 8.5" x 6"
Safe for Use in The Oven and The Freezer! You can store leftover chicken, meat or vegetables inside these freezer safe foil trays. This product is designed to withstand extreme heat and cold. Cook food up to 500 F inside these trays. They are the perfect replacement for Pyrex dishes or heavy-duty metal cooking pans. They are easy to handle and won't get bent out of shape. These pans are not just for catching drips on the barbecue. They can also be used as baking sheets or baking trays to bake cookies, brownies. You can line the foil pans with cooking parchment before use. The foil tray will ensure a nice crispy edge to your baked goods. by Keeping the grill neat and clean with this innovative Aluminum Silver Pans!  SAVE MONEY WITH THIS EXCLUSIVE BUNDLE OF DISPOSABLE ALUMINUM FOIL PANS - Includes 25 pieces of disposable steam table aluminum tin trays. They will arrive in durable packaging, so it will not get damaged during shipment. These durable cooking pans can also be reusable as they are very sturdy and high quality. Simply put them in the dishwasher or wash with hot water to use again.  SUPERIOR HEAT CONDUCTIVITY- Heats food evenly; and can withstand temperatures of up to 500 Fahrenheit. Always use oven mitts or silicone heat resistant gloves for a sturdy grip. 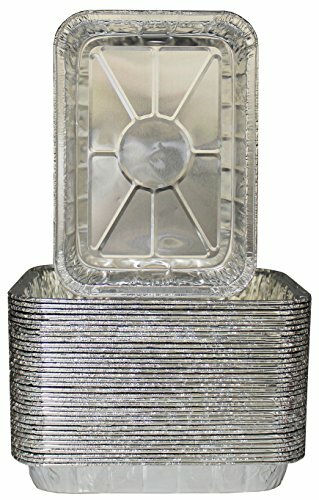 These aluminum foil trays are very sturdy for easy handling and serving. Thanks to our super Heat Conductive silver foil, it will evenly distribute the right amount of heat for perfect cooking results.  VERSATILE DRIP PAN FOR BBQ AND OUTDOOR GRILLS - These grease trays can be used with Weber: Genesis II LX 200 and 300 series, Q grills, Spirit gas grills. When grilling outdoors these pans will catch grease and drips from the BBQ. They also won't blow away in the wind. Enjoy the minimal cleanup when using these grease pans suitable for gas and charcoal grills.  NO MORE DIRTY DISHES TO CLEAN UP - These foil roasting plates are disposable and inexpensive so can be thrown away after use. This makes them the perfect cooking tray to use when having a barbecue, picnic or taking food on a day trip. No more Pyrex dishes to scrub or dirty Tupperware to carry home after a day out.  MULTI-PURPOSE SERVING PAN - This set of foil pans are ideal for catering party portions, broiling, baking, cakes, pies, casseroles, cooking, baking and more. They are safe for use in freezer, oven, and steam table. These are especially useful for catering businesses, schools, camps and food service facilities. These pans measure Top: 8.5" x 6" Bottom: 7.5" x 5" Height 1.5"